The Rosita Morning Glory vine is absolutely stunning. 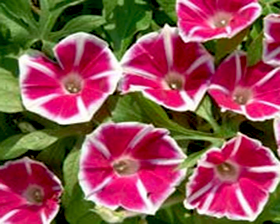 This Japanese Morning Glory features large 13cm blooms that are a color combination of a red flower with white star and white edge. Rosita Morning Glory is one of the most popular Morning Glories to grow, and it is carefree, free-blooming, and produces masses of brilliant flowers all summer and into the fall.